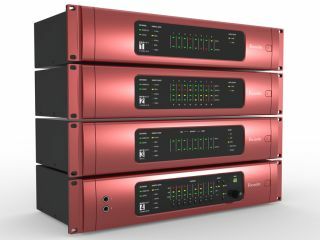 PRESS RELEASE: RedNet is Focusrite's new professional audio networking system. Launching with five brand new products and comprehensive control software, it delivers all the features required for a professional studio environment. Focusrite's 25-year legacy ensures uncompromised sound quality, while its robust, cutting-edge networking technology makes RedNet the number-one choice for the modern recording studio. At RedNet's heart is the tried-and-tested digital audio networking technology Dante™ by Audinate, the leading developer of high-quality media networking. Dante uses conventional IP-based Ethernet switches to carry up to 256 channels (128 inputs and 128 outputs) of high-resolution digital audio over a single, standard Ethernet network. RedNet provides extremely low latency: under three milliseconds analogue-to-analogue at any sample rate when using the optional Focusrite RedNet PCIe card. Dante is reliable: it has been in use for some time in the live sound field where it's deployed at major events, and live systems are routinely tested for up to a week without the loss of a single sample. Now, Focusrite brings Dante to the studio as part of a complete, scalable system with a range of extremely high quality digital audio interfaces and components. These provide a diversity of input and output options, with the simplicity and practicalities of Ethernet connectivity. What's more, RedNet is non-proprietary, meaning it will work with any ASIO- or Core Audio-compliant DAW, including Pro Tools 9, Logic and Nuendo. RedNet interfaces can operate alongside any supported PC or Mac with an Ethernet port (including laptops), using Audinate's Dante Virtual Soundcard (DVS) driver, meaning portable RedNet rigs can be configured. However, Focusrite's RedNet PCIe card, which features its own, single Ethernet socket, is dedicated to communicating with the RedNet network. It's the technology on this card that yields the extremely low latencies that make RedNet the ultimate studio upgrade. Each RedNet I/O device includes JetPLL™ jitter-elimination technology, and delivers dynamic range of 120dB, with 24-bit resolution at sample rates up to 192kHz. RedNet is the embodiment of the traditional Focusrite ethos: providing the high performance of today's most advanced digital conversion designs alongside pristine analogue circuitry and implementation, with exceptional value for money and stunning styling.